We explain how immersion and squad play will change the way you play Battlefield. Battlefield™ V is a vast game. It will have many improvements to the classic formula, as well as new additions and features. Following the reveal of the next chapter in the Battlefield saga, we know you’ve been eager to get a lot of gameplay questions answered. Let’s jump right in to the core gameplay changes and improvements that are coming in October. Remember, we are still working on the game, and the specifics of many features will evolve over time. A lot of ground will be covered in this post, but it will all center around two common denominators of the Battlefield V gameplay philosophy: immersion and squad play. Now, immersion can mean many things. For Battlefield V, it spans visuals and sounds, your soldier’s movement, combat situations, how you will shape the environment and vice versa, and how players will act and react more naturally than before. Let’s start with how you, as an infantry soldier deploying into battle, will maneuver through the battlefield. Our revamped soldier move set will affect both how Battlefield V will play and look. As you may have seen in the reveal trailer, you’ll be able to backpedal when lying down, jump through windows, and throw back grenades. Sprinting while crouching will be possible – and so will rolling, diving, and firing from positions you haven’t been able to fire from before. You will react to the world, but the world will also react to you. Move through tall grass, and the vegetation will move around you. This kind of thing is not just a neat effect – it will also affect gameplay; you may, for instance, notice a hidden sniper thanks to this. If that newly discovered Scout gets killed, you’ll see our heavier and more physical ragdoll system kick in. A body tumbling down a hill will kick up dirt and if it lands in a puddle, mud will splash. You’ll also see a lot more variation in the third-person movements of other soldiers. Previously, when running towards a Conquest flag with your teammates, you saw a group of people sprinting with the same basic move set. In Battlefield V, you might see one soldier stumbling when running up a hill or slipping if running through mud. Where you aim is where you’ll shoot. This will always be true in Battlefield V. Disregarding bullet drop over longer distances, the bullet will go where you have your sights. There will be no RBD (random bullet deviation). Weapon handling has been given a huge overhaul in general, all designed to crank up the immersion. For LMGs, for instance, you’ll find it easier to go in and out of the bipod positioning. We’re also bringing back bullet penetration in a big way. So, if you’re wielding an LMG, a stationary weapon, or similar and see an enemy dashing to cover – just rip it. Keep firing and tear that wall or fence down. This will give an extra utility to the Support class who, as you may know, is the class that gets to wield LMGs. 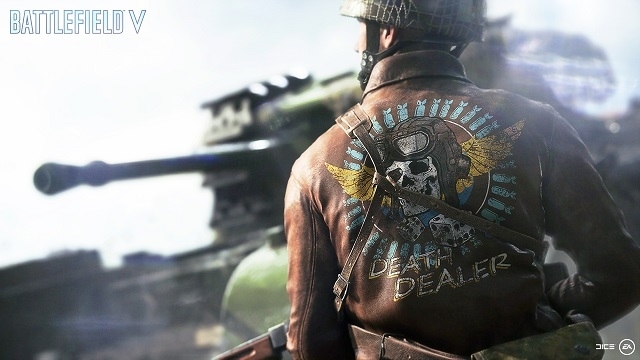 Developing Battlefield V, we’ve put a lot of effort into crafting the destruction – a true staple for the franchise – and it will be more dynamic than ever. As the battle rages on and structures collapse, you won’t see pre-determined animations – but dynamic sequences based on physics, materials, and the hardware being used. If you shoot a projectile that blows up inside a house, the walls will crack from the inside, making debris fly outwards. Drive a tank into a building, and the debris will instead move inwards. No matter how a building is destroyed, different parts of it will crack, move, and then crumble in a more time-extended way than in previous titles, where the fun of destruction ended quicker. Each match in Battlefield V should and will be different, and destruction is no exception. By the way, this will all sound spectacular. Trust us. Going hand-in-hand with destruction, the new Fortifications system is up next. This is something we’re particularly excited about, and having had the system in place for a while, it’s hard to imagine Battlefield without it. You can build various types of military assets thanks to Fortifications: foxholes, sandbags, barbed wire, tank stoppers, and more. You can reinforce buildings that have been destroyed. Remember playing Operations as an attacker, seeing the map being leveled throughout the match, leaving no cover left? That can now be countered thanks to Fortifications. This will all lead to much more dynamic gameplay. If you want to hold a flag, you can use Fortifications to close entrances to control points and funnel enemies towards you. This adds a tactical layer and more choice on the battlefield. In Battlefield V, everyone is equipped with a toolbox and everyone can use Fortifications – although the Support is the best at it. Play as this class, and you’ll also be able to build and repair stationary weapons. Moving on to Squad Play, there’s one key thing to know about Battlefield V: your squad will be more important than ever. Staying close to your squad, communicating with it, and playing well with it – this will all pay off. To facilitate this, you’ll be automatically placed in a squad when jumping into Battlefield V (though you can leave it if you want). We’re improving the communication options, so regardless of where you are – in game or in a loading screen – you’ll be able to chat with your squad mates. Bringing a downed team mate back into action with a revive has always been an exciting move in Battlefield, but for Battlefield V we hope to make this action even more intense – and personal. One key change: the non-Medic Classes will also be able to perform revives – if they’re done on a squad mate. Staying close to your squad will thereby be even more helpful. These squad revives won’t mean the Medic will be devalued though – quite the opposite. Revives by a Medic are much faster, can be used on all team members, and will bring a teammate back to full health, which squad revives won’t. We’re also adding a short physical interaction to the revive, meaning that you will be face-to-face with your teammate – no matter which end of the syringe you’re on. Seeing the face of your buddy (not to mention seeing each other’s visual customizations) will hopefully be a cool little moment. You’ll be able to revive from many angles, meaning you’re putting yourself less in harm’s way. Speaking of revives brings us to another new addition: dragging a teammate to safety. Say you’re playing on a high-octane map and a downed teammate is calling for help from a meat grinder area. Going for a revive in this situation has historically been a suicide mission. Your odds will be a lot better in Battlefield V. Run to your teammate, drag him to safety, and revive behind cover. You’ll feel like a hero (and score some more squad points). Attack a point – take damage – heal – rinse and repeat. In previous Battlefield games, your strategies were often quite similar from attack to attack. Full health regeneration and a high availability of ammo are two reasons for this. In Battlefield V, we’re adding a layer of scarcity of health and ammo. This will create new challenges when you approach new situations and more player choice. Let’s say you spawn into a Battlefield V Conquest match. Now, you can still head straight to the point you want to attack, but you may want to bring a Support player with you to not risk running out of ammo. Alternatively, if you want a well-prepped attack, you can gear up at one of your control points’ resupply stations, which can be built through the Fortification system. Then, after you’ve attacked, taken damage, and spent ammo, you find yourself behind cover, planning your next move. Your health will regenerate to some extent, but you won’t fully heal like in previous Battlefield games. Now, you have several options. You can try to flank the enemy point, you can rush the battlefield and loot downed enemies for ammo, you can find a Medic, or you can find a resupply station. The scarcity element can of course be used offensively as well. Do your enemies have a tight grip on a flag your team is fighting for? Destroy some enemy supply stations on other flags to make your foes sweat and change their tactics. Overall, we want you to be mindful of resources, and add a new meta layer of strategy. This will by no means make the game slower, though – this is still the hi-octane, fast gameplay that you know from Battlefield. And you can still be a lone wolf, just stock up in the resupply station or loot enemies. It’s all up to you. Another cool addition that will make you want to stick with your squad is Squad Reinforcements. Here’s how it works: when you’re working together as a squad, you’ll accumulate resources. Eventually, you will have gathered enough to give the squad leader the possibility to call in various reinforcements – which might be very powerful and turn the tide of the battle. In the reveal trailer, you saw a V1 rocket bring mayhem to the battlefield, and there will be other reinforcements at launch, like supply drops, smoke screens, and a certain tank with flamethrowers mounted on the sides. More reinforcements will be coming with the stages of Tides of War. Thanks for making it through this vast piece – I hope you’ve got some of your questions answered and that you’re as thrilled as we are for the gameplay innovations of Battlefield V.